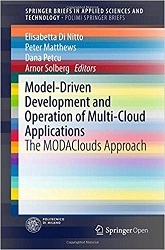 This book summarizes work being undertaken within the collaborative MODAClouds research project, which aims to facilitate interoperability between heterogeneous Cloud platforms and remove the constraints of deployment, portability, and reversibility for end users of Cloud services. Experts involved in the project provide a clear overview of the MODAClouds approach and explain how it operates in a variety of applications. While the wide spectrum of available Clouds constitutes a vibrant technical environment, many early-stage issues pose specific challenges from a software engineering perspective. MODAClouds will provide methods, a decision support system, and an open source IDE and run-time environment for the high-level design, early prototyping, semiautomatic code generation, and automatic deployment of applications on multiple Clouds. It will free developers from the need to commit to a fixed Cloud technology stack during software design and offer benefits in terms of cost savings, portability of applications and data between Clouds, reversibility (moving applications and data from Cloud to non-Cloud environments), risk management, quality assurance, and flexibility in the development process.